InSites provided landscape architectural services to compliment Ayokunle Odeleye's artwork, “Ascension to a Higher State of Being”. 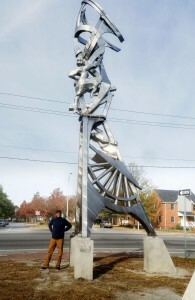 The series of stainless steel and concrete sculptures are within a narrow park adjacent to the historic Attucks Theatre, and terminating at the First Calvary Baptist Church. The radial design of the plaza and planting beds plays off the sextant featured prominently in the sculpture.